There I stand staring off into space from the roof of my small town apartment block listening to the cries of millions, millions all about to die. I turn the radio to hear the report. 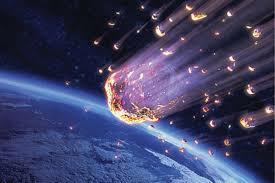 A large meteorite is heading straight for the Earth and will end the world and life as we know it. My name is Tom I’m not very special nor am I great, I’m just Tom. Simple easy Tom, and as I stand here listening to the cries of my friends, my family, my loved ones. I begin to think why, why us, why now, why! I panic thinking of my life before this. I think what a waste of time it was, all the terrible things I had done and all the pain I had caused. I settle down breathing slowing, calmly. Thinking what can I do, how can I save us, how I can atone for my sins. I look out to see people collapsing on the streets as the burning heat from the meteorite gets closer and closer. The smell of burning flesh reaches me I begin to vomit feeling as if all my insides had just come out and are sitting on the floor next to me. I rush back downstairs to see if my family are alright. My wife Jane and two kids Joseph and Sally sitting there falling over from heat exhaustion. I rush to their sides forcing water down their throats. They jump back up as if they had been brought back from the dead. The sound of the radio catches my attention again. “Attention all citizens, any surviving personnel we have a shuttle waiting just outside the east end of the city. Please head towards it as fast as possible.” Without a thought in my head I rush the children and my wife into the car. I have decided on one thing that I will not change and that is that I will protect my family above all cost. We hit road diving past all that remains of this broken city. The bodies of the fallen fill the streets making it hard to find a clear route out. I look out my window to see the remaining people walking like zombies exhausted to the point where nothing remained in their heads. Their eyes as white as snow and bodies covered in blood and sweat. Bang! Out of nowhere one of these zombies jumps at the car window screaming out in pain HELP ME! HELPME! Blood dripping from her pale eyes and her skin covered in torn bits of flesh. She falls from the window in a fit. I look back to see her screaming on the ground. It looked as if she was burning alive. I focus my mind on my family looking forward and forgetting what had just occurred. We continue through the city with every block we pass the more bodies we see. Even worse seeing the bodies of people we know. We make it past the half way point out of the city with about 30 minutes until the shuttle leaves. If we don’t make it we die. I continue to drive until the car makes a sound. It starts to slow down until we stop altogether. I get out to see what has happened. Popping the hood to discover that the engine had overheated and I realise we would have to walk the rest of the way. I call everyone together but notice that Sally is missing. “Dad she went that way” says Joseph. I run in that direction with Jane and tell Joseph to stay in the car. I find Sally with one of her friends from her school. She is there with two other figures, her friend’s parents. Both of which have been turned into zombie like people. I try to pull Sally away but she screams out “I’m not leaving my friend behind!” Her friend is standing there trying to snap her parents out of it but nothing happens. I decide to take her friend to save her. Leaving her parents behind. We rush to the car Jane keeping the girls calm. Joseph gets out of the car and we continue on foot. We push through the heat like soldiers in the war. After a while Sally falls exhausted. I pick her up and we carry on. We begin to walk up a large hill of sand all of us exhausted and ready to give up. I can feel my flesh burning off. We push on until we reach the top of the hill looking over to see the end of the journey. There the shuttle sits in the middle of the dunes. We rush down filled with excitement forcing ourselves forward to make it. We arrive at the entrance of the shuttle were we are meet by a man who tells us to rush into the shuttle. He finds us food and drinks and then gives us rooms to rest. We take off escaping the end of our world and arriving at a new time in the life of the human race. We watch from a window the destruction of our home, our planet. Will the human race ever be the same? Will we be able to live without our Earth?